This slide show uses low-res photographs taken during the commemoration at a place on the former Somme battlefield known as Ginchy Telegraph. 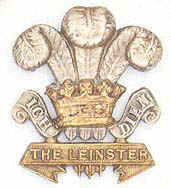 After the battle for Ginchy on the 9th September 1916, the 6th Leinsters were reduced to 15 Officers and 289 other ranks. There are 12 photographs in this slide show.